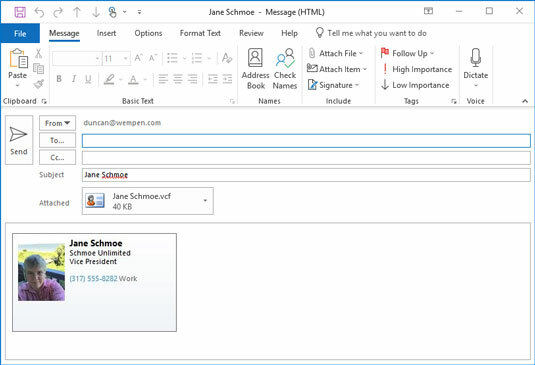 Microsoft Outlook 2019 can forward an electronic business card to any other person who uses Outlook (or any other program that understands how to use digital business cards). It’s a handy way to email any contact record in your list to anybody else. In the People module, create a contact record for yourself. It should have all the information you want to send someone. Double-click the contact record that has the information you want to send. The contact record you double-clicked opens. Click the Forward button on the Contact tab on the Ribbon. A menu offers three choices: As Business Card, In Internet Format (vCard), and As an Outlook Contact. Choose the format you prefer. If you’re not sure, choose As Business Card. That sends both kinds of cards — in Outlook format and Internet format. A new message opens, as shown here, with the contact information attached. In the To text box, type the address of the person who should get the message. Or click the To button and pick a name from the Address Book. Click the Send button (or press Alt+S). Your message and the attached vCard are sent to your recipient. When you get a business card in an email message, you can add the card to your Contacts list by double-clicking the icon in the message that represents the business card. Doing so opens a new contact record. Simply click the Save & Close button to add the new name — along with all the information on the business card — to your Contacts list. You can also forward a business card by clicking the contact record and then clicking the Forward button on the Ribbon. This is a few mouse clicks shorter, but your forwarding options are reduced to sending as a business card or as an Outlook contact.